The new AS-1400 is the latest addition to Galaxy Audio’s highly acclaimed line of Wireless Personal Monitors, offering high end features and performance at a very affordable price. 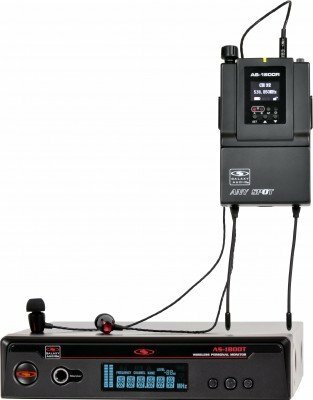 The transmitter features stereo XLR/1/4" inputs, headphone output with volume control, input level control, and LCD display for channel and input level. The Receiver features Mixed Mono Mode for your own personal mix, volume, and an LCD display with channel, battery level, and RF level. Galaxy Audio’s new comfort EB4 premium earbuds feature titanium drivers, extended bass response, aluminum alloy construction, and now come standard with all WPM models. The AS-1400 is perfect for the working musician, House of Worship or any application requiring an affordable, reliable WPM system. Featuring Mixed Mono Mode 275 Selectable Channels UHF Phase Locked Loop Blacklit LCD (Displays Channel Number and Freq.) Stereo or Mono Transmission Multiple Receivers can be used with 1 Transmitter 300' Range The Mixed Mono feature allows performers to adjust the balance of the Left and Right audio signals sent from the transmitter right on the body pack. With Mixed Mono: The performers can have their vocals in Input 1 and the band mix in Input 2 and adjust the volume of each independently to create their own personal mix, or You can send two different monitor mixes from the board so each performer can decide which mix they want to hear on their belt pack. 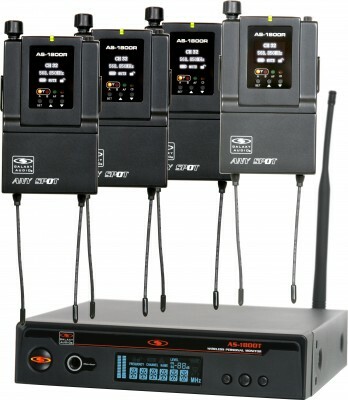 The AS-1400 Band Pack Systems makes it easy for any band to Get Personal. The system Includes four receivers and one transmitter. It is designed to get the whole band wireless in one package. Additional transmitters may be purchased at a later date to add mixes. The new AS-1400 is the latest addition to Galaxy Audio’s highly acclaimed line of Wireless Personal Monitors, offering high end features and performance at a very affordable price. 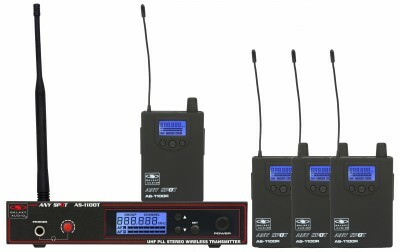 The transmitter features stereo XLR/1/4" inputs, headphone output with volume control, input level control, and LCD display for channel and input level. The Receiver features Mixed Mono Mode for your own personal mix, volume, and an LCD display with channel, battery level, and RF level. Galaxy Audio’s new comfort EB4 premium ear buds feature titanium drivers, extended bass response, aluminum alloy construction, and now come standard with all WPM models. The AS-1400 is perfect for the working musician, House of Worship or any application requiring an affordable, reliable WPM system. Featuring Mixed Mono Mode 4 Receivers and 1 Transmitter 275 Selectable Channels UHF Phase Locked Loop Blacklit LCD (Displays Channel Number and Freq.) Stereo or Mono Transmission Multiple Receivers can be used with 1 Transmitter 300' Range The Mixed Mono feature allows performers to adjust the balance of the Left and Right audio signals sent from the transmitter right on the body pack. With Mixed Mono: The performers can have their vocals in Input 1 and the band mix in Input 2 and adjust the volume of each independently to create their own personal mix, or You can send two different monitor mixes from the board so each performer can decide which mix they want to hear on their belt pack. The EB6 features a single driver delivering full frequency performance. 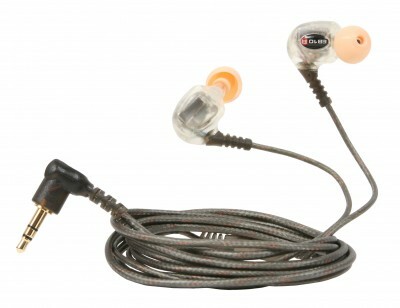 The EB6 has a cable over 4 feet long and the ear buds weigh 6g (less than 0.25 oz; excluding cable). The EB6 includes a durable plastic carrying case with three pairs of Silicon Sleeves (small, medium and large). Wideband Dyna Driver ear buds reproduce the full frequency range with natural mids, full highs, and rich bass. They allow musicians to monitor their mix with full detail. Three different sized pairs of silicon sleeves are provided for best fit and sound isolation. Ergonomic mechanical structure ensures long time, low fatigue use.